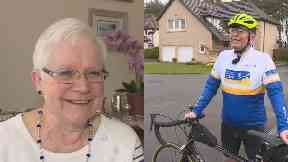 John McNally, 81, will take part in the Etape Caledonia across Highland Perthshire in May. It's safe to say that John McNally's not your average pensioner. The 81-year-old from Fife is training for the Etape Caledonia through the Scottish Highlands for the 12th year in a row. Next month, when he will have turned 82, he will be cycling 85 miles across mountains and glens in one of the toughest routes in the country. Mr McNally said: "I've been retired 24 years so I've had the time to train, and Els is supportive of it which is good, and that's really what makes it. "If you can train, you don't need to be training fast. Just get the distance in; hopefully keep as fit as you can." His wife of 52 years, Els, admits her husband is almost obsessive about his keep fit regime. She said: "There's nothing else goes between his ears, but cycling and running. "He's very fit. Every day he runs, but he does nothing else, and doesn't know we have a hoover." Mr McNally started to keep an eye on his fitness when a former work colleague died in his late 40's. That inspired him to keep as healthy as he could and he took up running. He then found a new passion after he was invited by friends to take part in the Highland Cross - a 50-mile duathlon across the Scottish Highlands. 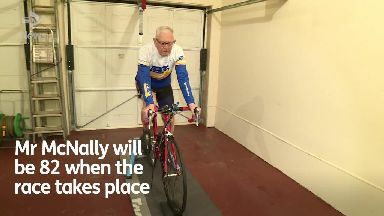 The Etape Caledonia previously had an age limit on participants in the race, up until last year when Mr McNally led a challenge to let cyclists over the age of 80 take part. He won his argument and raced last year. Now, he's going to be raising funds for Marie Curie in this year's race on May 19. For Mr McNally age is just a number and not something that has ever concerned him. He said: "A few years ago I was asked 'did you worry when you were 70?' and I said 'no, why would you worry about something you can do nothing about'. "I was asked the same question again when I was 80." Instead, Mr McNally hopes his adventurous pursuits will inspire someone else to lace up their trainers and hit the great outdoors. His ever supportive wife added: "He is lucky to be coming on to 82 and not to have anything wrong with him. "But no, he is very fit. It's the way I look after him." For more information on the Etape Caledonia, go to etapecaledonia.co.uk.